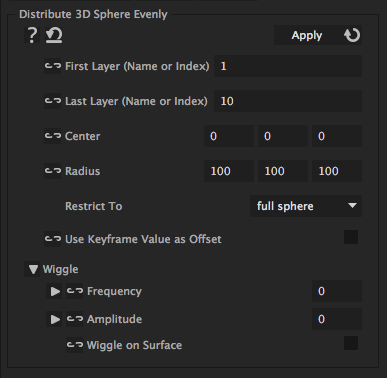 With this iExpression you can distribute 3D layers (or other 3D properties) evenly on the surface of a sphere or ellipsoid. You can still move layers away from their random position using their keyframe values or the wiggle parameters. In order to orient the layers correctly on the sphere surface, apply the "Look At Point 3D" iExpression to their orientation and choose as "Look At" point the center of the sphere. If you want to move or rotate the sphere, its best to set the center to (0,0,0), then create a new NULL object, make it 3D and parent the layers on the sphere surface to this NULL. During the parenting, keep the alt or option key pressed. Then the position of the NULL becomes the center of the sphere and you can move or rotate it using the transform controls of the NULL. is the name or index of the first layer that should be placed on the surface of the sphere. is the name or index of the last layer that should be placed on the surface of the sphere. is the center of the sphere. is the radius of the sphere. For spheres choose the same value for x, y, and z component; otherwise ellipsoids are generated. allows to restrict the placement of the random positions to the upper or lower half of the sphere. adds the keyframed value of the property to the random value. This allows you to move the property away from its keyframed value using keyframes. makes the layer wiggle around its random position with the given frequency. If you don't want it to move at all, set the frequency to 0.
denotes up to how much the layer may move away from its random position when it wiggles. makes the layers stay exactly on the sphere surface while they wiggle.